...Funds tracked to BitStamp? Update: Bitstamp say not their address. • Shuts down V2, files for bankruptcy! • ...claims Torihiki has 'ended all association' with MintPal. If you have missing funds from the recent Mintpal / Moolah debacle, please report it here. And if you want to, say how many are missing. Then if you have any luck getting missing coins back, please share too. The goal of this thread is to provide a place where people can share info on the Mintpal situation openly and without censorship or filtering so we can build an accurate picture of what's really happening. If we can get enough information and people together, we can get a criminal investigation started to see what really happened and maybe recoup funds. Please repost this thread, first we need information as to what the picture is on how many coins have gone missing. NOTE: Coins need to be 'left on an exchange' in orders so you can buy/sell coins or there wouldn't be any liquidity, and for users with high trade volume this can be a lot, there is no blame in this. Even people who take precautions loose coins when exchanges go bad, implying all users are careless when they have money stolen doesn't help anybody. Update: I am not updating the figures right now as too hard to match any returned funds to previous reports that they were missing, but please keep reporting so the missing funds are documented in the thread and the information is on record. 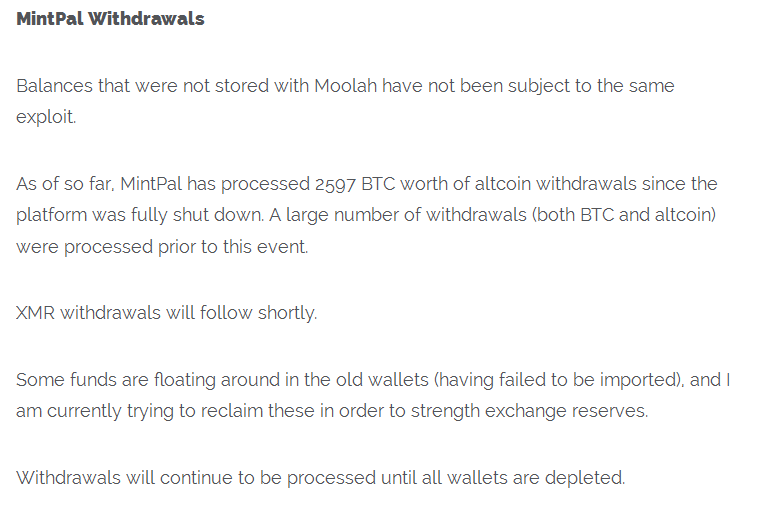 Some alts have been returned but BTC still missing, and many people still have zero balances, can't withdraw or can't login, and as usual support tickets are being completely ignored by Moolah and they won't provide any actual details on the real situation. Once we know whether Green is going to return the missing BTC, I will start generating the report on that so we can do a final tally of what is missing. 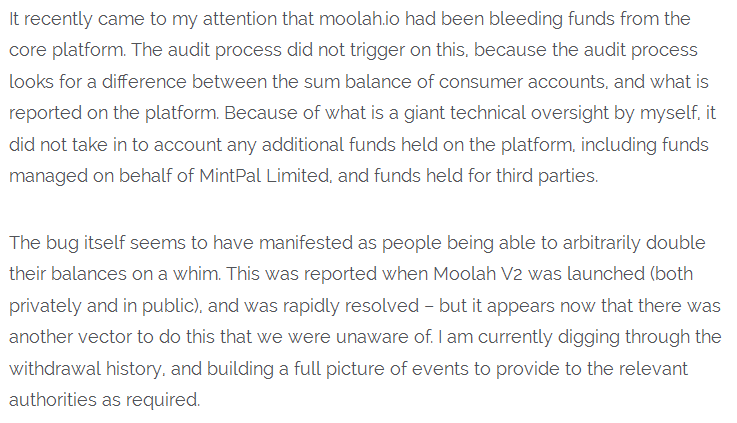 Re: MintPal / Moolah - Class Action - If you lost coins, post it here! Me! 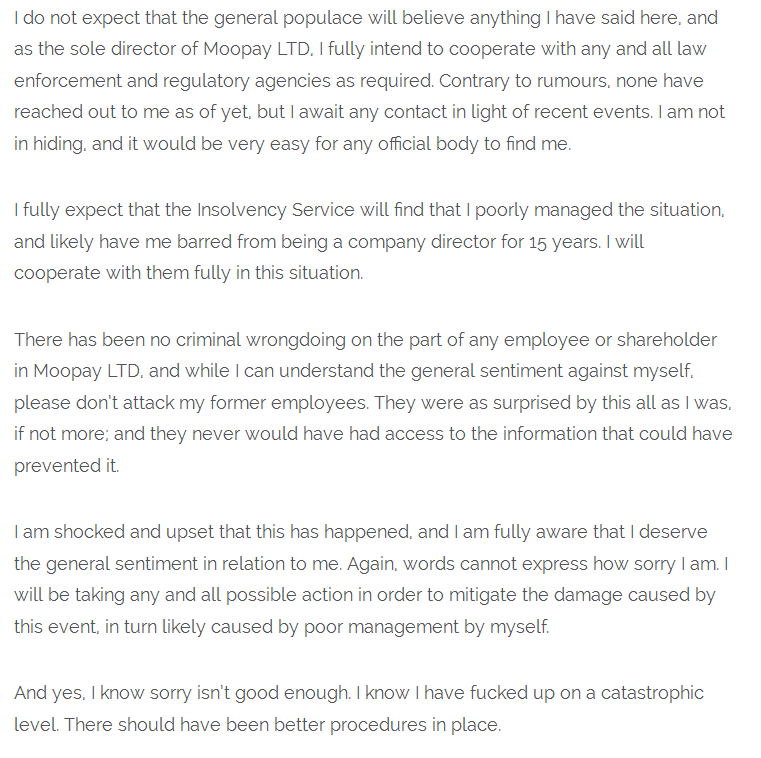 8 BTC lost since Mintpal V1 was taken down, no reply to numerous emails, support tickets and eventual legal threats. You are right generally, but my 8 BTC was only sent the same day to buy DRK with when the site was taken down instaneously with no warning. You have to 'leave funds on the exchange' in a buy order to buy coins with...or how to buy coins? Of course there is no legal 'class action' in the UK - Class action in this sense means we get together, find out how many coins have gone missing, and we work together and help each other to go after Moolah to get them back. Thats bad luck then, yup.. Various legal routes. We need to untangle the ownership of Mintpal to find out who to sue for the funds to get them back. If it's MooPay Ltd the bankruptcy procedure will provide some routes. Secondly, criminal proceedings against the Directors if we can show malpractice or illegal use of / theft of customer funds. I still have an open ticket, sent 1,000,000 karma coin to mintpal and nothing arrived, I have been told they are investigating. Hope that in the end we'll get our funds back. hope so too, that's a lot. thanks. thanks, I added a section to the OP to list any coins returned since listed here, let me know if you get anything back. Re: MintPal / Moolah - LOST COINS - If you lost coins, post it here! Gox, Cryptorush, Mintpal, CoinEx, Coinmarket + maybe some more. Crypto is crazy, sorry for your loss.